In my previous post, I explained how a cover painting on the January 1965 issue of MAN TO MAN magazine led me on a hunt for information about the now nearly-forgotten pulp illustration artist Peter Poulton. 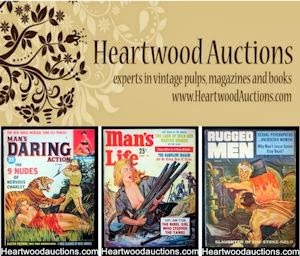 Initially, almost all I knew about Poulton was that he had done cover paintings for a few men’s adventure magazines in the 1950s, including as AMERICAN MANHOOD, MR. AMERICA and (I believe) MAN TO MAN. I couldn’t find any websites about him or any online biographies. The first bio I found was in Robert Weinberg’s pioneering reference book BIOGRAPHICAL DICTIONARY OF SCIENCE FICTION AND FANTASY ARTISTS (1988). It didn’t include birth and death dates and only mentioned Poulton’s work for science fiction magazines, noting that nearly all of them were interior illustrations. After searching around in Amazon.com, I bought Jane Frank’s awesome book SCIENCE FICTION AND FANTASY ARTISTS OF THE TWENTIETH CENTURY: A BIOGRAPHICAL DICTIONARY (2009), which provides more in-depth bios of many Twentieth Century illustration artists. Frank is one of the premier authorities on vintage science fiction, fantasy and horror artwork in the world. Her Wow-Art gallery website is unique and mind-blowing. Her BIOGRAPHICAL DICTIONARY (one of a series of books she has published about art and artists) is pricey but worth it for serious fans of vintage illustration. (March 24, 1914-May 2, 1972) American artist. Born Nelson Poulton, in Barnesville, Ohio, and known variously as N. Peter, and Peter N. Poulton, the artist was one of many who entered the science fiction field during the boom years of the early 1950s and he was one of the best. Little is known about Poulton’s formal education or career. He apparently had only one year of college before enlisting in the Army in 1942. By that time he was living in California, although after the war he lived and worked in New York City. His father, Elmer Antone Poulton, was a painter who worked as an interior decorator in Barnesville for many years, and was recognized as a master craftsman; it is possible Peter Poulton learned his skills from him. Weinberg notes that Poulton used a sharp pen-and-ink style as opposed to the many artists who worked in grease pencil or wash during the period. For shading he used detailed cross-hatching and stipple work to produce the desired effect. In many ways, his work was very much in the style of Virgil Finlay. Although Poulton did not have the near photographic realism of Finlay, his art often expressed a lighter, more humorous touch. Poulton handled human figures well but also was not afraid to depict unusual aliens or strange machinery in his art. Although he was primarily an interior artist, he also painted several attractive covers for Future Science Fiction, and one book cover, Earthbound --- a novel in the classic Winston science fiction series for young readers. Poulton was unmarried, and died in New York at fifty-eight; he was buried at the Long Island National Cemetery, on Long Island. 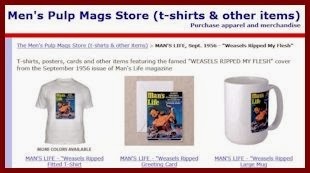 Like Weinberg, Frank omits any reference to Poulton’s work for men’s adventure magazines. 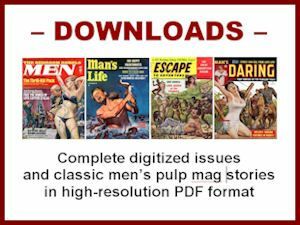 According to Peter Haining’s book THE CLASSIC ERA OF AMERICAN PULP MAGAZINES (2000), Weinberg and Frank may be wrong about Poulton entering the science fiction field in the 1950s. Haining suggests that Poulton began working for science fiction pulps as early as 1939. And, he shows a pen-and-ink illustration that the caption says was done by Poulton in 1939 for Anne McCaffrey’s first published story “Freedom of the Race.” However, when I double-checked that, it turned out to be wrong. McCaffrey was only 13 years old in 1939 and, as documented by many books and websites, “Freedom of the Race” was first published in the October 1953 issue of SCIENCE FICTION PLUS (a.k.a. SCIENCE FICTION +). It is possible that Poulton started working as an illustrator before 1950, But I couldn’t find any examples of a Poulton illo dated (credibly) prior to 1950. Weinberg, Frank and Haining do all agree that Poulton was one of the best science fiction pulp artists of the 1950s, putting him in the same league with well-known illustrators like as Rudolph Belarski, Rafael DeSoto, Ed "Emsh" Emshwiller, Leo Morey and Norman Saunders. And, he illustrated stories by many great science fiction and fantasy writers, such as McCaffrey, Richard Matheson, Murray Leinster and John Wyndham. Sadly, Poulton’s science fiction and fantasy artwork has largely been forgotten, even by science fiction fans. And, his men’s adventure artwork appears to have been totally overlooked, even by illustration experts. Thus, it’s not easy to figure out exactly how many illustrations Poulton did during his relatively brief career and what magazines they appeared in. The Weinberg and Frank books list more than 60 issues of various science fiction magazines that featured illustrations by Poulton. They also note that he did the cover painting for the 1952 John C. Winston Co. edition of the science fiction novel EARTHBOUND, by Milton Lesser. I eventually found a longer list of Poulton’s science fiction artwork on the Internet Speculative Fiction Database. It records appearances of Poulton’s pen-and-ink interior illustrations in more than 80 issues of various science fiction magazines from 1950 to 1957. Frank and the ISFDB also list two sci-fi magazine cover paintings by Poulton: for FUTURE COMBINED WITH SCIENCE FICTION STORIES, November 1951 and FUTURE SCIENCE FICTION STORIES, September 1952. After more searching online, I found scans of both of those covers and over twenty of Poulton’s interior illustrations for ‘50s science fiction pulp mags. 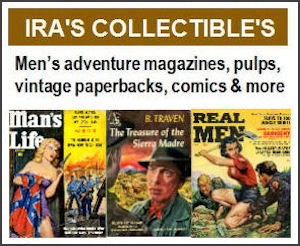 I found almost nothing online or in print about Poulton’s work for men’s pulp adventure magazines beyond a few scattered cover scans. So in this post and my previous one I’m adding to the body of knowledge about Poulton by showing the men’s adventure artwork I know he did (based on signatures, credits or other clues I have confidence in) plus several MAN TO MAN covers I believe were done by him (based on eyeing them). In contrast to his science fiction art, which was dominated by interiors, all of the men’s pulp adventure magazine illustrations I know of by Poulton are cover paintings. I have not run across any men’s adventure interiors by him to date. 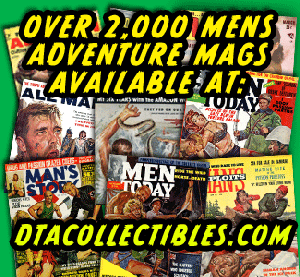 If you know of others, please let me know by shooting me an email or by posting a note in the Men’s Adventure Magazines Facebook Group, where a lot of knowledgeable fans and collectors of both science fiction and men’s adventure artwork hang out.